Daphne are a fragrant ornamental shrub that do well in shaded areas. As most species flower in winter, they are a feature in nurseries at this time of the year. 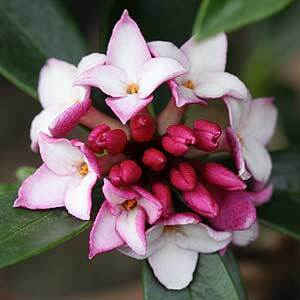 The popular and most fragrant is the pink flowering Daphne odora along with the white flowering D.odora ‘alba’. Although the species are very popular, a number of hybrids are now being offered by growers. some with improved flower size, some with longer flowering season and other more tolerant of sun. Wholesalers growers offer these varieties in good numbers from winter onwards when they are in flowers. Some growers will offer advanced specimens. A number of other Daphne Varieties are also available, many with claims to be improved forms. It is the hybridised forms that are being sold as ‘much improved’, however some are very fast growing and with a very different habit than the familiar D. odora. Wholesalers usually offer only a few forms, mostly Daphne odora or cultivars with D.odora as a parent. Daphne bhoula – Largest growing of the Daphnes, upright and semi deciduous to evergreen depending on how cold the winter is. Will reach 2m in height. Flowers open to white. D. genkwa – Deciduous variety that grows well in open sunny positions. Attractive puple flowers on bare stems in late winter to spring with only a slight perfume. D. cneorum – Rarely available, beautiful low growing species. D. serica – Rarely available. Daphne Eternal fragrance – A recent introduction from the UK. Said to be longer flowering and more tolerant of sun than others. Daphne Perfume Princess – A recent introduction from New Zealand. Fast growing, with good large flowers, a recent release.